Go Pac Rim with hearty curried lamb shanks. Photo courtesy of Meat And Livestock Australia. Lamb shanks are hearty comfort food. This recipe gives them an Thai twist, with Thai green curry paste, coconut milk, lemongrass and fresh ginger. This is Page 4 of a four-page article. Click the black links below to view the other pages. Prep time is 20-30 minutes with a slow cook time of 2 to 3 hours. This recipe is great with steamed snap peas and a chilled glass of chardonnay or sauvignon blanc. Serves 4. 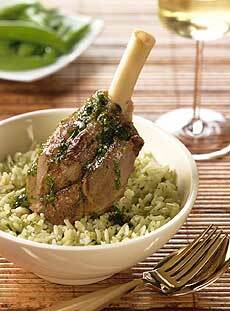 Trim lamb shanks of excess fat and sinew and place in large dish. Combine coconut milk, lime juice and zest, curry paste, and half of the lemongrass and ginger. Pour over shanks. Cover and marinate in refrigerator 2 to 3 hours, turning lamb occasionally. Drain lamb well, pour marinade through a sieve and set aside. Heat oil in large casserole dish and sauté onion with remaining lemongrass and ginger. Add lamb and brown on all sides. Add the marinade and wine, and bring to boil. Reduce heat, cover and simmer for 2 to 3 hours or until cooked as preferred. When the lamb is nearly cooked, prepare the rice. Place cilantro in a food processor and add oil and vinegar. Process until smooth. Add more oil, if necessary, to make a sauce consistency. Set aside. Cook rice according to directions on the package and fluff with fork. Fold through half of the cilantro dressing . Spoon rice onto plates and top with lamb shank. Spoon over strained pan juices and drizzle with remaining cilantro dressing. Serve with steamed snap peas and a chilled glass of chardonnay or sauvignon blanc.